Place the eggs in a pot, cover with water and cook until the water boils. Reduce the heat to its lowest point and simmer; remove after 9 minutes. Change out the hot water for cold water and tap the eggs to crack them. Cool them in the same water. In the meantime, mash the avocados in a bowl with a fork. Add the onions, tomato, hot sauce, lemon juice, salt and pepper. Set aside. Peel the eggs when they’re cool. Cut them in half and remove the yolks with a spoon. Set aside. Fill each egg with guacamole. Use a strainer to press the yolks through so they come out like thin noodles over the guacamole. 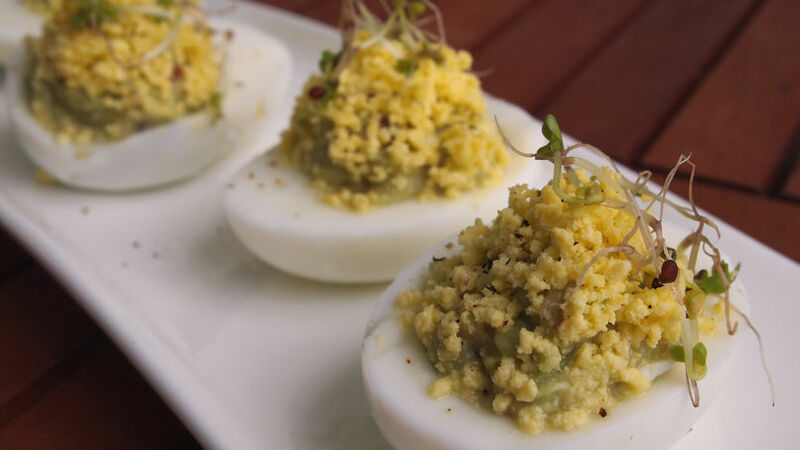 Place a bed of kale sprouts on a plate and over this place the devilled eggs. You can cut up the yolks and add them to the guacamole. In El Salvador they also add bits of egg whites. If you have fresh cilantro, add 1/2 a tablespoon of chopped cilantro to your guacamole. Use any sprout you like in place of kale sprouts. Decorate with jicama cubes or cooked asparagus tips. Among my many Easter recipes, I never fail to prepare guacamole devilled eggs. My grandmother loved preparing these delicious snacks to keep the kids and grandkids busy until the food was ready; needless to say, we accepted them happily and hungrily. The best part of this dish is that you can change the filling as you see fit, and adapt it to what you have on hand. You can use tuna, vegetables or anything else you like. And if you serve them over slices of bread, you'll be indulging in a Peruvian trifecta: a delicious sandwich with hardboiled egg, avocado and tomato slices, along with a bit of mayonnaise. I promise the result will be delicious, especially considering the simplicity of the ingredients. And if you want to be the queen of the kitchen, I recommend making these devilled eggs with quail eggs. All you need to keep in mind is that quail eggs cook in just 7 minutes and must be peeled immediately so that the shell doesn't stick. You see? You can have a simple but delicious recipe ready for Easter in no time!